So, Jim's parents were over for a visit last week, which was really great. 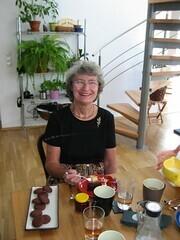 They arrived on Mom's birthday, which we celebrated with a German cheese cake (no cheese in there, only curd). 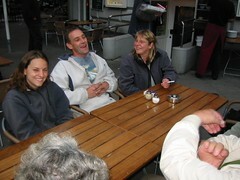 Circe and Carsten joined us and we had a nice, relaxing afternoon. Circe figured out that she sees Mom and Dad once a year. We'll see where they meet next year. 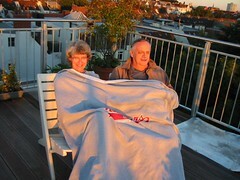 Later on, Mom and Dad were enjoying the Sunset on our roof terrace, in proper style with a Rutgers Blanket. 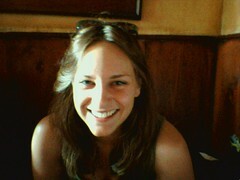 On Sunday after I went to the election (what a disaster!!!!! 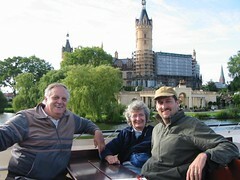 - I can't believe what happened) we all went to Schwerin, a nice little town in the former Eastern part of Germany an hour east of Hamburg. A lot was rebuild after reunification, and it looks quite nice with all its lakes around and the huge castle. 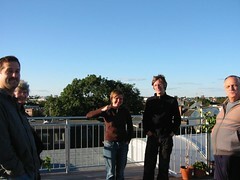 Esther, Knut and Bosse came from Rostock and joined us for the day. 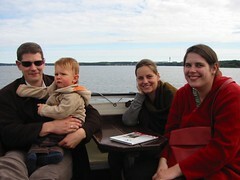 We had lunch at a nice brewpub, went to the Musuem in the castle and finshed the day with a nice 1-hour boat tour. On Monday Jim and Dad went to IKEA to buy a new bed, which Mom and Dad gave us as a house warming gift. 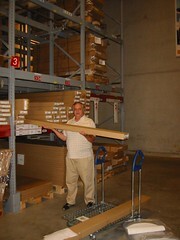 Dad has never been to IKEA but it seems he was quite impressed by the concept behind the store. In the evening we met Thomas, Thomas and Birgit for dinner at a nice Turkish restaurant where Mom, Dad, Jim and I had been six years ago - that was actually in the beginning of Jim and my relationship. 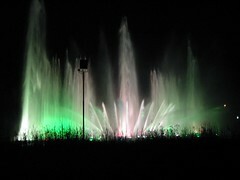 Later that night we went to the Planten un Blomen Park and enjoyed the water light concert. 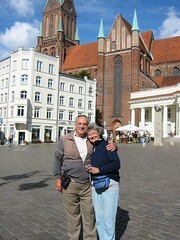 Mom and Dad went to Berlin the next day and slept over. After a short fly-by here, they went home on Thursday. We hope they enjoyed their stay! New instrument and other random stuff!